First Quarter: Tom Briody and Carla Walter. Second Quarter: Jyoti Chokshi and Kevin Leong. Third Quarter: Jim Patrick and Carla Walter. Fourth Quarter: Jim Patrick and Carla Walter. Each winner will receive a Paul Harris Fellowship. Jim will receive two PHFs; Carla will receive three. Congratulations to all! Many thanks to Lilian Tsi-Stielstra and her husband, Scott, for hosting the Club’s Super Bowl party. 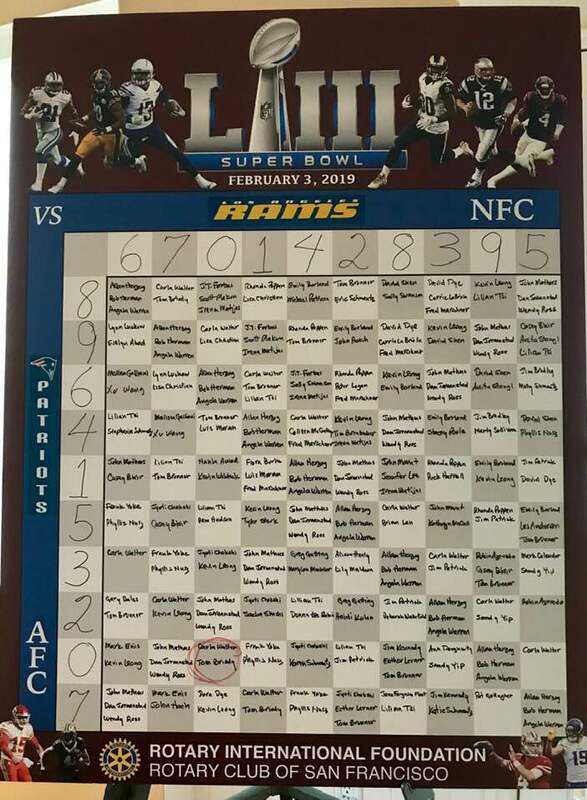 Kudos to Fred Marschner for an outstanding job of running the Super Bowl Pool, as always. The three of you are our Club’s MVPs.